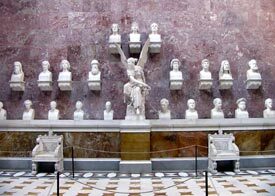 ABOVE: Busts of famous Germans, Swiss, and Austrians line the walls of Walhalla. 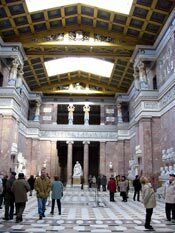 INSET BELOW: A general view of Walhalla's statuary hall. Ludwig I himself chose the first group of 150 notables and unknowns to be honored with busts or plaques; more have been added over the last century and a half, ranging from household names like Johannes Brahms and Albert Einstein to Sophie Scholl, a Munich student and resistance leader who was executed by the Nazis in 1943. To be eligible for induction into Walhalla, a candidate must have been dead for at least 20 years, a native speaker of German, and a person who has made a significant contribution to society. Nominations are reviewed by the Bavarian Academy of Sciences.